A viable alternative to new or existing sites that doubles the number of cars parked in the same volume of traditional parking and provides it at approximately equal or lower cost than a conventional approach. AUTOParkit™ is more sustainable, faster to build, less expensive to operate, safer for the community and it provides a necessary, convenient, alternative to an escalating global problem. AUTOParkit™ delivers benefits to OWNERS, MUNICIPALITIES, and USERS. Although distinct groups, they all value AUTOParkit™ a fully Automated Parking System. Imagine parking twice the cars in the same space! AUTOParkit™ addresses parking volumetrically. The architecture of AUTOParkit™ provides solutions for both new and existing construction projects. It is a collection of subsystems that are fabricated off-site. This allows us to build a tailored solution for each site from the same set of reusable building blocks. Those subsystems include a Pallet to hold the vehicle, a Lift to move the vehicle vertically, a Shuttle to move the vehicle horizontally, and a stall to store the vehicle until the user requests its return. Best of all no intermediate floors required. AUTOParkit™ offers various environmental frameworks that provide an opportunity for LEED solutions. The Modular/Scalable Architecture reduces construction time since most of the subsystems are fabricated off-site and integrated during the construction process when the proper construction equipment is still on-site making it easier to place the largest subsystems. Installed cost comparable to above-grade concrete parking structures and less expensive than subterranean structures. Because the vehicles are turned off there is no need to exhaust CO2 and other emissions from the garage. This allows developers to design garages that can fit into any context. The AUTOParkit™ at the Helms Bakery for example, uses a Ferrari Fabric which during the day appears solid and at night is translucent. Due to the steel structure, the façade can be fabricated out of several materials including brick, stucco, glass, wood, metal to conform with the surrounding buildings streetscape. Operating costs 40% lower than traditional parking. AUTOParkit™ uses only world-class controls with built-in redundancies, including industrial rated electric motors and variable frequency drives. Safety devices include ultrasonic sensors, light curtains, motion detectors and HD internet cameras. No attendants required with AUTOParkit™ which is self-monitored with notifications on performance, sent electronically via text message or email. 75% of system is capital equipment allowing for accelerated depreciation. Converting a traditional parking structure to anything other than a ramped, cement parking structure (short of complete demolition) is highly unlikely. Not with an AUTOParkit™, it has several built-in adaptability features! The number of Electric Vehicle increases - AUTOParkit™ offers as an option an Automated Electric Charging Station which can be added to any stall to allow for vehicle charging when parked. The AUTOParkit™ is fully equipped to individually meter each stall’s electricity usage and allow for proper customer invoicing. Parking Demand Increases – Space permitting parking levels can be extended or added, leveraging the same automation infrastructure. Accurate metrics indicated a surplus of parking stalls – The surplus can be converted to (i) a Storage Container can be added to any standard pallet allowing for self-storage that is both safe and convenient. (ii) Since no one enters the rack storage area, stalls could be leased for secure long-term storage of luxury vehicles. (iii) A pallet can be converted for bicycle storage (see below). (iv) The AUTOParkit™ can also be equipped with a Manual Valet Option to allow for an attendant to park vehicles for nearby businesses or events. (v) The AUTOParkit™ can be equipped with a Dock Pallet to accommodate surf boards, winder surfers, kayaks, and canoes. Demographic changes - Due to the modular scalable architecture stalls can be removed and two levels of parking can be converted into rentable space. When an AUTOParkit Load Bay is ADA accessible then all automated stalls are ADA compliant. 65% of all assaults by a non-family member occur in parking structures but NOT in an AUTOParkit since the vehicle is returned to the owner in a locked, safe, secure Load Bay. Less than 10% of the AUTOParkit is publicly accessible. Researchers at the Department of Transportation have concluded that over 50 % of the traffic in a typical downtown is simply on the road circling the block and searching for vacant convenient parking spaces. AUTOParkit™ can be easily implemented in many dense locations where a conventional garage cannot fit. Convenient and affordable parking is favored by non-residents. By denying access to vehicles, the technology dramatically reduces the opportunity for crime. Parking is one of the largest single land uses in our municipal footprints. This is a debilitating force on downtown areas that threaten its economic potential and vibrancy. AUTOParkit™ provides the community planers the ability to build a smarter city. Leveraging automated parking for vehicles, bicycles, personal storage and marine crafts AUTOParkit™ reduces the necessary footprint and eliminates the specialization making it a mixed-use, adaptable garage. AUTOParkit™ can be erected to service a building, a city block or entire neighborhood. It can be used by tenants, the public or by valet attendants. The Drop-off / Pick-up for a vehicle is in a Load Bay. The Load Bay is similar to a large single stall garage that features security cameras monitored 24-7. The Load Bay is also well lit and locked. Only the vehicle’s owner can unlock the Load Bay to retrieve the vehicle. Load Bays are normally at grade which reduces the time and distance for walking to the Load Bay. The Lobby Areas are secure, well lit, and informative with a Queue-Monitor to help direct a user to the proper Load Bay. Overhead doors open/close automatically so a driver concentrates on the entrance/exit. AUTOParkit™ eliminates the frustration of endless searching for an open parking spot, which saves fuel and time. AUTOParkit™ automatically places your vehicle in the best available location safely and swiftly. No one takes your keys or enters your car – EVER. And once you have dropped off your vehicle you are on your way. AUTOParkit™ removes the fitful search to find the proper exit stairwell or elevator since most Load Bays are at grade. 40-180 Seconds Retrieve Time is the standard design requirement. AUTOParkit™ is also capable of “zero” wait time for a user. Zero-wait time is when the driver and their vehicle arrive at the Load Bay at approximately same time. 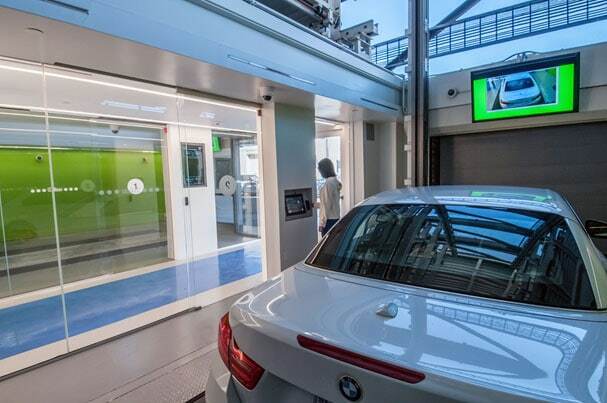 When Remote Retrieve Kiosks are stationed along walk-paths a user can request their vehicle then continue their walk to the parking garage so that by the time they arrive, their vehicle can be in the Load Bay. No one enters your vehicle. Your vehicle is NOT subjected to scratches or dings from another vehicle. It is not at risk of scraping a cement column. It is NOT vulnerable to a break-in since the storage rack that holds all parked vehicles is not accessible to the public. AUTOParkit™ brings your vehicle to you. You are no longer subject to crowded exit lanes that become artificially congested when some inconsiderate driver decides to wait for that “perfect" spot. AUTOParkit’s mobile app allows you to schedule your retrieval time, pay for parking and provide you with an accurate status of your vehicle’s position. Have you ever forgotten where you parked your car or worse, walked to where you were certain you parked it, only to discover that it is not there? AUTOParkit™ knows exactly where your car is at all times, so you never have to remember floor, row or space. The AUTOParkit™ Load Bays are equipped with two overhead doors allowing the user to pull forward upon entrance and pull forward upon exit. When a Load Bay has only one overhead door, AUTOParkit™ rotates the vehicle 180° to allow the driver to pull forward upon exit.